Part Used & Method for Pharmaceutical Preparations: Oyster shells are collected from the ocean in winter or spring. They are cleaned and dried in the sun, then pounded into powder. Functions: 1. To pacify the liver and subdue the yang; 2. To soften hardness and release nodules; 3. To stop perspiration, nocturnal emissions and leukorrhagia by astringents. 1. Deficient yin of the liver and kidneys and upward flaring of yang manifested as dizziness, vertigo, blurred vision, tinnitus, palpitations, irritability and insomnia. Oyster shell (Muli) is used with Dragon's bone (Longgu), Tortoise plastron (Guiban) and White peony root (Baishao). 2. Late stage of febrile disease with exhaustion of yin and body fluids which leads to malnutrition of tendons and muscles manifested as spasms, or convulsions. Oyster shell (Muli) is used with Tortoise plastron (Guiban), Donkey hide gelatin (Ejiao), White peony root (Baishao) and Turtle shell (Biejia) in the formula Sanjia Fumai Tang. 3. Scrofula due to phlegm and fire. 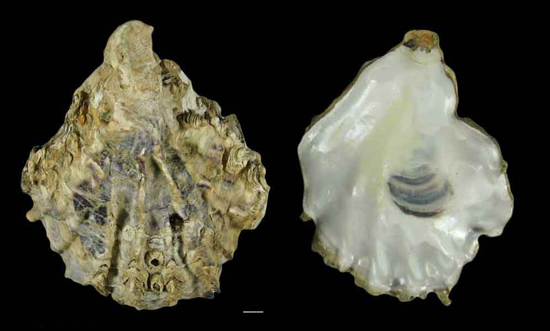 Oyster shell (Muli) is used with Thunberg fritillary bulb (Zhebeimu) and Scrophularia (Xuanshen) in the formula Xiaolei Wan. 4. Spontaneous sweating and night sweating due to weakness of the body. Oyster shell (Muli) is used with Astragalus root (Huangqi), Ephedra root (Mahuanggen) and Light wheat (Fuxiaomai) in the formula Muli San. 5. Nocturnal emissions due to kidney deficiency. Oyster shell (Muli) is used with Flattened milkvetch seed (Shayuanzi), Euryale seed (Qianshi) and Lotus stamen (Lianxu) in the formula Jinsuo Gujing Wan. 6. Uterine bleeding and leukorrhagia due to deficient Chong and Ren meridians. Oyster shell (Muli) is used with Dragon's bone (Longgu), Dioscorea (Shanyao) and Schisandra fruit (Wuweizi). 7. Concha Ostreae can be used to relieve hyperacidity and acid reflux of the stomach. Dosage: 15-30 g, decocted in water before other herbs. The calcined form is used to induce astringency and relieve hyperacidity.